Even newborns need to be checked for subluxations. The birthing process can be traumatic for you and your newborn, this process unfortunately remains under-treated. There are many factors that can cause birth trauma, including: long or very short labor, false labor, the use of drugs to increase contraction intensity, failure of the mother’s cervix to dilate, the use of vacuum extraction or forceps, cesarean sections because of lack of progress, cord around the baby’s neck, fetal distress, or incorrect positioning in the uterus (during pregnancy) or the birth canal. Unfortunately spinal misalignment is often left uncorrected for years, because misaligned vertebrae can affect nervous system function, it is absolutely crucial to check for the presence of vertebral subluxation early in life to prevent potential early wear and tear of the spine (Arthritis) and symptom related nerve pressure. 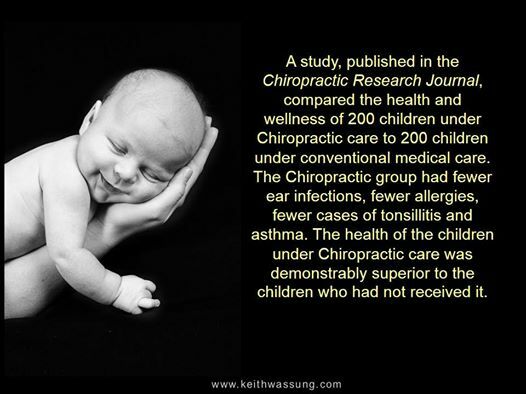 It’s also important to understand that chiropractic adjustments for children differ significantly from those performed on adults. Light fingertip pressure is used. Think of how much pressure you can place on your eyeball or a tomato and that is the amount of pressure applied on a newborn.